The Business of Real Estate is very demanding and few have an appreciation for the emotional toll is casts on its practitioners. On the surface the public sees a sign placed on a yard, a flyer printed, and then months of waiting… Under the surface the layers of paperwork, marketing materials, meetings, courses, and endless phone conversations and showings to make the sale are not always well appreciated. One difficulty faced by Real Estate Agents is “Time Management” and like for most Business Professionals the adage “there aren’t enough hours in the day to get everything done” remains true. Many will tell you that technology is making the problem of Time Management bigger, where others will tout how an iPad with the proper App will solve all your scheduling problems; both of course are true and false. Time Management Problems are a Scapegoat of sort – it is so easy to blame one’s shortcomings on a ephemeral idea! Can we look at this so-called problem with some distance and start putting it in its proper perspective? 1. Whatever you did not get done today was put on your calendar by you in the first place! For some of you the problem is not Time Management it is Time Illusion; you put so many things on your to-do list that have no chance of getting it done and then blame time for it. Your solution is simple: Start putting less items on your calendar. 2. 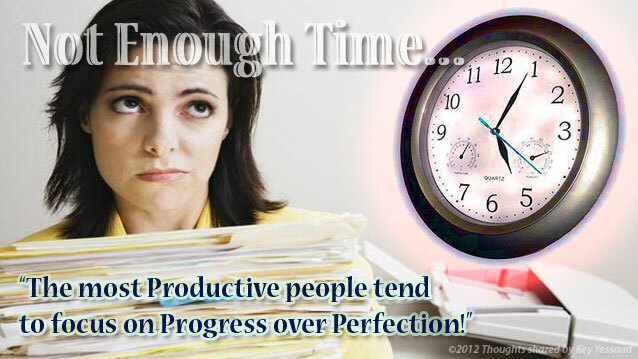 The accomplice of Procrastination is Perfectionism! Some Real Estate Professionals get so wrapped up in one task they sacrifice the rest of their to-do list to the perfection of one task. This is sometimes due to more needed training so the task can be accomplished faster; or worse: the fear of doing something more important but involves emotional distress. In the Real Estate Business ‘Face to Face Prospecting’ is very important but rejection can leave a bitter taste. Get to know yourself and see if you are avoiding important tasks because of some fear or other – once you come to grips with this truth go to your broker, or Coach and let them help you have a breakthrough with it. 3. Some tasks will be put off till another day - This fact is absolute! In the Real Estate Business your time belongs to your clients, at least large portions of it. Try to squeeze a couple of hours early in the day to do all your MUST tasks; as your day progresses you may drop some tasks that you needed to accomplish today – contact the person most affected by your delay and fess up, then let them know when you will be able to get it done. Lack of communication is an emotional wrangler – many tough problems can be solved by choosing to communicate. 4. Be honest that some of your time is being squandered on wasteful activities! You are not the only one – we all do it. Some Psychologists argue that spending 2 hours on Facebook when you know that 15 minutes should be your max comes from a sense of being overwhelmed with the work, or the environment of the work. Give yourself a break from overly judging yourself but also be honest about your habits – find a colleague and work with them; being isolated maybe causing you to be overwhelmed. Success is not how much you can manage your time or how many tasks you got done today; Success is driven by Progress Not Perfection! Your mode of telling all in this article is actually good, every one be capable of simply understand it, Thanks a lot. Thanks on your marvelous posting! I certainly enjoyed reading it, you happen to be a great author. I will ensure that I bookmark your blog and definitely will come back later on. I want to encourage continue your great job, have a nice day!